Quickstop Tools has teamed up with Safety Technology Incorporated to introduce our new fire sprinkler tool mounting system. STI has been manufacturing top of the line fire protection products for over 30 years. The Q-M gives you the ability to securely mount your sprinkler tool in a visible area for quick deployment. Designed to be used indoors or out, the Q-M is made of tough polycarbonate material and has a lockout tag deterring theft of the tool. Each case holds one Quickstop Talon or Multi-Tool and comes with a laminated instruction sheet describing easy use of the tool. Shop our QuickStop tools today and contact us with questions! Free shipping is available on select $99 orders. Allows occupants and employees to easily locate the tool. 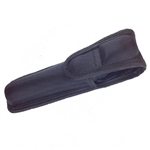 Cover is molded from thick, clear, tough polycarbonate material. Low profile – ADA Compliant. UV-stabilized to keep cover clear outdoors.